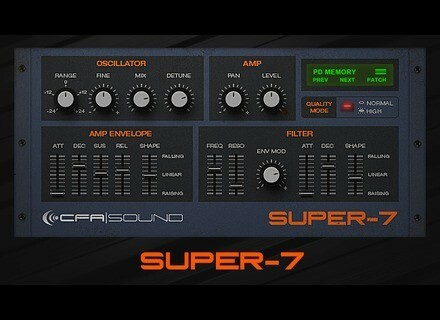 Super-7, Other Virtual Synth from CFA-Sound. CFA-Sound celebrates its 7th anniversary and offers Windows user a VST synth inspired by the famous Roland Supersaw. Super-7 is a polyphonic virtual analog synth modeled from the legendary Supersaw oscillator found on the Roland JP8000/8080 hardware synths. CFA-Sound says that the sound may not be an exact replica of the original, but he got as close as possible. 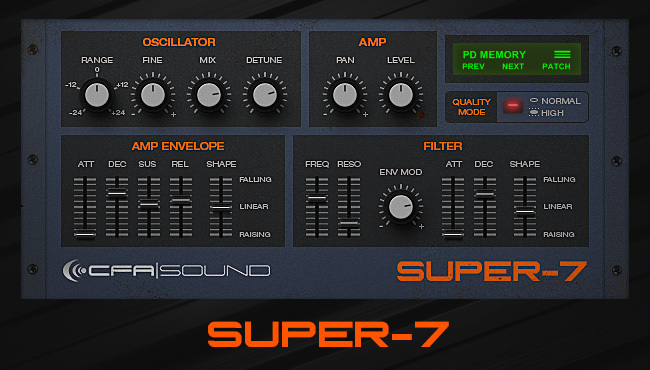 Super-7 offers 32 voices of polyphony, a 4-pole low-pass filter, shapeable envelopes and 20 presets are included. The VST 32-bit plug-in for Windows is available for free download from shop.cfa-sound.com. Rhythmic Robot PanaRhythm and special sale Rhythmic Robot want to make it up to everyone who experienced issues with the launching of new website with a free instrument and a special sale. HoRNet FilterSolo plug-in HoRNet introduces FilterSolo, a new resonant filter plug-in with modulation capability for Mac OS X and Windows. 1st preset pack for Omnisphere 2 If you buy the Audiority Omnisphere Total Bundle, you’ll receive a preset pack for the upcoming Omnisphere 2 for free.